Every new Kia is streets ahead of car it replaces. This is also the case with the new Picanto. It is a very competent little city car, with some strange quirks. I found the steering a little odd and took some getting used to, but after 5 days I got the hang of it. The steering is electronic and has a built in inertia at the dead ahead point which is quite disconcerting at first. You do get used to it. Another quirk is the rather large cubby hole at the back. I never quite found the boot. Unless the cubby hole is the boot. Mmmm. It’s possible. When I took delivery the average fuel consumption was an alarming 8.9 litre/100km. By the time I gave it back it had dropped to 6.6 litre/100km, which included city driving, going up 8 flights in a parking garage daily and about 35km of highway driving, and back, at around 120 km/h every day. Not too shabby. You should be able to achieve around 6 litre/100km. 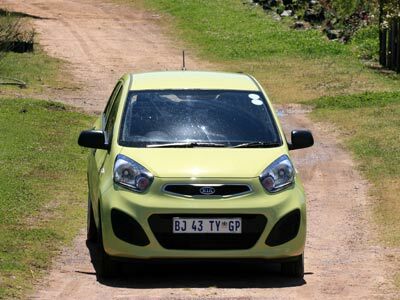 The Picanto is very well put together and everything is where you would expect it to be. All the switches and controls are easy to use and do what they are supposed to. The MP3/CD/radio is good and can take iPod, AUX/USB inputs. It is a simple well put together car best suited to urban driving. Visibility is excellent and the driving position is comfortable. It is an easy car to drive once you master the steering feel. 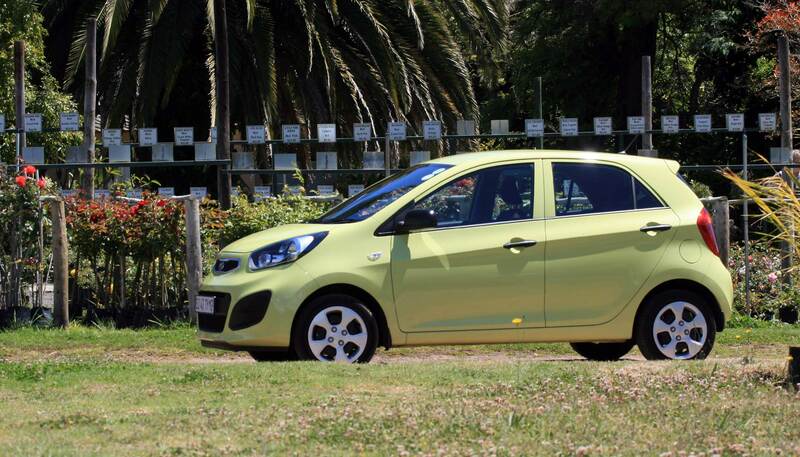 The body of the Picanto is stylish, with smooth lines and a look of its own. From the front its quite commanding. a bit like a Chihuahua. Small, but thinks its big. The side view is almost sporty. I get the impression that it will last well and not give problems. Easy to drive and easy to own. There are a number of things I needed getting used to. The interior uses a lot of hard plastic. The design of the top of the dash causes a quite bad reflection in the windscreen, especially for short drivers. The seats feel a little thin for long roads but are fine in town and the passenger does not get an airbag unless you get the LX. Legroom in the back is on more than cramped, but fine for children. The boot is… small. OK for shopping, but not more than a trolley full at a time. The fuel gauge is inconsistent. It drops rather quickly when near empty. Apart from the top of the range EX, ABS is sadly missing. If all you want is a simple, reliable city car then the Picanto checks all the right boxes. The LX models add electric windows in front, front fog lamps and a rear wiper. The EX models add ABS, leather steering wheel with remote controls, rear electric windows and Bluetooth. The Picanto starts at R99 995 for the 1,0 manual, the 1.0 Auto as tested is R109 995. The top of the range 1.2 EX Auto is R125 995. The best value is probably the 1,0 LX Auto at R117 995. Picanto comes with a 5 Year/100 000km warranty, a 3 Year/100 000km anti-corrosion warranty and 15 000km service intervals. 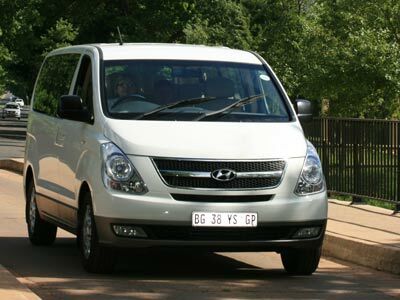 Both the Hyundai H1 bus and van take Hyundai to the front in the standard or medium size van and kombi segment. The Koreans have got it just right. A willing engine, good road holding, space and excellent build quality. It is also good looking and a pleasure to drive. I was impressed. With the recent addition of the 2.5 TDi diesel engine to the package which has a cavernous interior, excellent cabin, superb equipment levels and good road manners I predict the H1 will dominate the medium van and bus segment. There is not a better buy. The H1 bus comes with aircon which has temperature and speed control for the back vents, sound system with aux input, alloy wheels, leather upholstery and ABS. The H1 has sliding doors on both sides making for very easy access. Seats are comfortable, especially the front seats. The driving position is excellent with all round visibility and all controls in easy reach. The cabin is well designed with a myriad storage spaces and a good feel to it. The quality of interior finishes and materials is excellent as is the switchgear. It is a pleasant place to be. The H1 is easy to manoeuvre and to drive. Steering requires only a light touch and the breaks are excellent. The automatic gearbox has been very well matched to the CRDi engine which gives good consumption figures of around 10 litres/100km. The H1 has plenty of usable power and torque and never strains to carry its load. Acceleration (especially when overtaking) and top speed are both good for this type of vehicle. It almost feels nippy. It’s like driving a large powerful car, even around corners. The park distance control system makes parking a breeze, as it is quite a wide vehicle and 5m long. The petrol engines do this vehicle a disservice. They are underpowered and feel anaemic. The bus does not have a lot of space in the back if you need luggage space for all 7 or especially 9 passengers. The volume control for the radio is a little far away from the steering wheel. To some the looks are a little too conservative and commercial. It could be argued that it is a little small compared to the Toyota Quantum or Mercedes Vito but to many that may be a plus. I recommend you get the diesels. Forget about the petrol models. Drive the Hyundai and you will probably choose it above the competition, especially when you factor in the price and service plan. 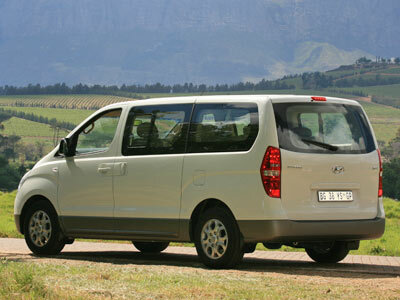 The Hyundai CRDi panel van costs R264 900 and the bus R373 900. Competitors include the VW T5 Kombi at R449 000 ( thats R90k more! ), Mercedes Vito R392 616, FIAT Scudo R396 900, Nissan Primastar/ Opel Vivaro R329 000 (a bit smaller). Included in the price are the very good 5 year / 150 000 km warranty, 5 year / 100 000 service plan and roadside assistance. The Amarok Double Cab is now available with a TSI petrol engine. The introduction of a 2.0 TSI 118kW engine completes the Double Cab model line-up that includes 2.0 TDI 90kW and 2.0 BiTDI 120kW derivatives. All the engines are mated with a 6-speed manual transmission. 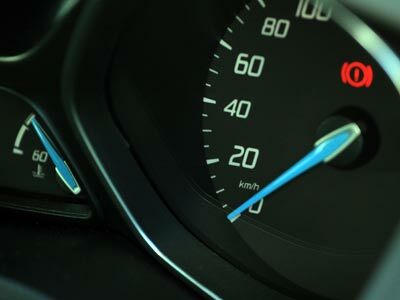 An automatic transmission is planned for introduction in the third quarter of 2012. To date, Amarok Double Cab has sold over 4 500 units and has a market share of 15.5%, which makes it the second best-selling Double Cab bakkie in South Africa in 2011. The four-cylinder 2.0 TSI engine uses a turbo-charged induction system and 16-valve cylinder head. Its maximum power of 118kW is delivered between 3800 rpm and 5500rpm. It is in torque delivery, however that this engine really excels with 300 Nm delivered from just 1600 rpm right through to 3750 rpm. The direct injection fuel system has an operating pressure of 190 bar (2760 psi) for optimised fuel atomisation and complete combustion for high efficiency and low emissions. It accelerates from 0 to 100 km/h in under 10 seconds and has a top speed of 180 km/h. This level of performance is matched by exceptional fuel consumption of 9,6 l/100km and CO2 emissions of 228 g/km. Amarok Double Cab model range comes standard with a 3 year/100 000 km manufacturer warranty and 5 year/90 000 km Service Plan. The Ford Cortina was our car for the people in the seventies before Ford’s Sierra took over the role. It may just be that the new Focus takes up where they left off. It is more than good enough. It has it all. Good looks. Space. Handling. Power. And good value for money. I think this new Focus is a real looker. Both the sedan (pictured) and the hatchback are really good looking cars inside and out. The car is in balance. Walk around the car and you won’t find an angle that is out of place or appears clumsy. It all fits together very nicely. The handling and performance is excellent. The turbo diesel we drove has loads of oomf and happily pushes you back into your seat when you put pedal to metal. Reminded me of the old Basil Green performance Fords, just better round corners. Fuel consumption figures are excellent. Expect around 9 litres per 100 km for the petrol cars and under 7 for the diesels. The light blue indicator hands of the dials are ugly. The instrumentation designer should be sent back to design school. Perhaps he is a little colour blind and just did not see just how ugly it is. You kind of get used to it after a while. In a way it fits in with the rest of the displays. I did not like the button shift arrangement for changing up and down. Instead of paddles or a gearstick up down arrangement the head of the gear lever has an up and a down button on it. Weird. 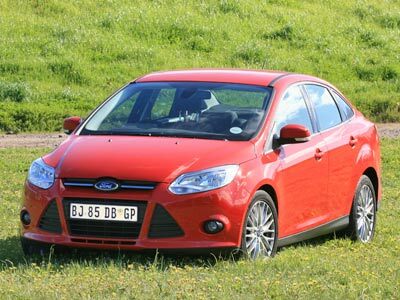 Ford is back, big time, with a car to take on the Golf. The one to get is the 2.0 TDCi Trend PowerShift at R281 100. With 120 kW and 340Nm of torque you wont look back. We drove and enjoyed the 2.0 Trend PowerShift with 125 kW and 202Nm priced at R264 300. The Focus range starts at R208 400 for the very efficient 1.6 Ambiente. The 2.0 Sport hatch at R266 200 will appeal to the young at heart.